And why is there one? The gender pay gap is the difference between what women earn on average and what men earn on average. This is usually expressed as the ratio of women’s average hourly earnings to men’s. In June 2018 New Zealand women earned on average $27.41 an hour compared with an average of $31.82 for men - that is, women earned 86.14% of men's earnings, a gap of 13.86%. This is a small increase in the gender pay gap from last June (86.9%), as this year men’s average hourly rate increased more than women’s despite an substantial pay equity increase in the wages of over 60,000 carers. The median hourly rate – the rate which half are above and half below – is $23.75 for women and $26.15 for men – that is, the median woman earned 90.8% of the wage of the median woman (2017: 90.59%), a gap of 9.2%. This smaller gap may reflect pay increases this year for more than 60,000 carers, but the lack of improvement in average hourly pay measure suggests increased wage polarity and sector differences (i.e. rates increasing among higher paid males). In June 2017 New Zealand women earned on average $26.70 an hour compared with an average of $30.74 for men - that is, women earned 86.9% of men's earnings, a gap of 13.1%. This is a slight improvement on 2016. This data comes from Statistics NZ's Labour Market data, now collected by Household Labour Force Survey in June and made available 1 September. In 2016 New Zealand women earned on average $26.05 an hour compared with an average of $30.11 for men - that is, women earned 86.4% of men's earnings, a gap of 13.6%. There were some small technical changes in the survey from this year, but no real change from 2015 when women earn on average $25.35 an hour compared with an average of $29.44 an hour for men. That is, women earned 86.1% of men's earnings, a gap of 14%. In 2014 New Zealand women earn on average $24.70 an hour compared with $28.70 an hour on average for men. This was 86.06% of men's earnings, down from 87.3% in June 2013. For several years women's average ordinary time hourly pay rate has hovered around 85-86% of men's. There was an improvement from 85.9% in June 2011 to 87.3% in June 2012 - which may have been partly due to stagnation in average wages for Pacific and Asian men in that year, but recent downturns confirm there is no overall trend towards improvement of women's wages. 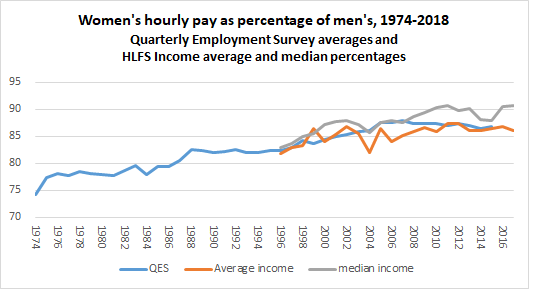 Progressin reducing the gender pay gap has been slow, as the graph shows. It narrowed quickly following The Equal Pay Act 1972 narrowed the gap by 5 percentage points by 1978. Over the last 17 years, it has improved by just five percentage points. It is notable from this graph that the trend has improved at times of positive policy action by government. There are also gaps in average hourly earnings between New Zealand's main ethnic groups. Maori and Pacifika women earn least on average. In 2018 Maori women earned on average 76.2%, and Pacific women 72.3% of the average for all men. Maori women earned on average 72.2% and Pacific women earned on average 68.5% what Pakeha men earned. In 2017 the ratios were 76.9% for Maori women and 72.1% for Pacifika women compared to all men, and 72.7% for Maori women and 80.7% compared to Pakeha men, the group whose average pay is highest. The hourly rate for the job is the best indicator of whether women are being paid fairly compared to men because weekly and annual earnings are affected by part-time or casualised employment. The social and economic reasons women are disproportionately in part-time and casualised employment go far beyond the direct and indirect pay discrimination that New Zealand laws seek to address. The gender gap in weekly and annual earnings is important, though, because it contributes to family poverty (particularly for women raising children alone), and to decisions within the family about who does what and whose work is important. Lower pay than men for tertiary qualifications reduces women's ability to pay off student loans. Lower earnings over a lifetime reduce women's ability to save for retirement. Statistics NZ's 2017 Labour Market Statistics (Income) data showed women's average weekly earnings from wages and salaries were $923 compared with $1,274 for men; that is, 72.4%. Maori women earned $100 less - $824, which is three-quarters of the average weekly earnings for everybody, and two-thirds of the average for Pakeha men. Pacifika women averaged $782 a week. In 2016 women earned on average $887 a week compared with $1249 a week averaged by men - 71%. The 2015 Income Survey showed women's average weekly earnings from wages and salaries, at $432 a week, were 61.1% of men's earnings of $707 a week (Table 2). In 2014 women's average weekly earnings from wages and salaries were $426 compared with $679 for men - 62.7%. The reason for the bigger gender pay gap in weekly wages than in the hourly rate is low wages in part-time jobs done mainly by women. Statistics NZ defines full-time employment as 30 hours a week or more. A third of working women are employed for less than 30 hours - three times as many part-timers as among men. The median hourly rate paid to women working 30+ hours a week in June 2015 was 82.97% of the median for men working 30+ hours, up from 94% in 2014 and 88.4% in 2013. But half the women in part-time work earned less than $17.26 (2004 IS Supp.Table 11). For example, Kristine Bartlett, an experenced resthome carer, is paid just $14.46 an hour. In 2011 the Ministry of Education published a study entitled What do men and women earn after their teriary education? It showed that in many occupations tertiary qualifications make very little difference when it comes to the gender pay gap. Four years after graduating, women earn on average $4,380 less than men with the same qualifications. The only professions where this is not the case are the performing arts and information systems. In some sectors, the pay difference is nearly $8,000 per year. There has also been a series of Vice-Challencellors' reports that show women's graduates are paid less than men graduates after three or five years, across the labour market and particularly in different (gendered) industries. The State Services Commission's annual report Human Resource Capacity in the NZ state services provides a little information on the gender pay gap in core public services and agencies. In June 2014, the average salary was $76,784 for men and $65,932 for women, a difference of $10,849. That is, women earn on average 85.9% of men's average salary. In June 2013, the ratio was 85.6%, slightly down on 2012 (86.3%). The improvement shown in the mid 2000s (83.9% in 2006) appears to be stalling. In the year to June 2013 male salaries had increased by 2.5% but female salaries by just 2.0%. The 2014 report notes that 'a higher proportion of women work in the lower paid occupation groups than men and this contributes to the gender pay gap... pay gaps by occupation are all lower than the overall pay gap because people in equivalent roles are being compared' (p.32). That is, the kinds of work done predominantly by women in the public service are being paid less than those done by men. However, the State Services Commission report appears to be presenting this as an explanation, not an problem to be resolved in compliance with New Zealand and international law on the principle of equal pay for work of equal value. Statistical sources, and the merits and limitations of different surveys and indicators, are discussed Measuring the Pay Gaps. CEVEP's view is that the best indicator for monitoring the gender pay gap is the one we have been using and reporting on longest - average hourly ordinary time earnings, measured annually in June. Recently, government ministers have switched horses to quoting median earnings (the middle earner), rather than the average of all earners. The gender pay gap on the median wage tends to sound better, even if the dollar amount is lower (see explanation here). For example, in June 2014 the median hourly pay rate for women was 90.1% of the median hourly rate for men, compared with 86% for the average. The 2014 median shows that half of all New Zealand women are being paid less than $20.73 an hour, and well below the average for women of $24.70. In June 2013 the median hourly wage for women was a little lower: 89.9% of the median hourly wage for men. The gender ratio for the median wage was a little higher than for average hourly earnings (87.3%), but the dollar amount was nearly $4 lower. Half of all New Zealand women were earning less than the median of $20.30 an hour - and well below the average for women of $24.19 an hour. In 2000-2 the Department of Labour published several reports on pay and employment differences between men and women, in the public service and in the labour market as a whole. One of these was a statistical analysis exploring reasons for the gender pay gap in average hourly earnings. Only 10% can be attributable to educational differences, said the report. Younger women have caught up to and are surpassing young men in educational qualifications. There is still an education gap for Maori and Pacific people compared to Pakeha, though within Maori and Pacific groups there is little difference in achievement by gender. The Department of Labour report found 15-50% of the pay gap is linked to gender differences in years of workforce experience, although this is less after 10 years or more. Related to workforce experience is an additional small effect for having two or more dependent children. The largest factor - accounting for 20-40% of the gender pay gap - is differences in the kinds of jobs that men and women did. Women are concentrated in low-paying occupations and industries. This left 10-50 percent of the gender pay gap 'unexplained' by the analysis. However, the researchers expected that, if pay data were available for jobs categorised in more detail, more of the gender pay gap would be attributed to occupational differences. CEVEP believes that the gender pay gap could be narrowed by policy that addresses direct and structural (that is, occupational) discimination in women's pay. Pay equity means that women have the same average pay as men (once any clearly justifiable differences, say in qualifications or hours, are accounted for). Why are women's occupations paid less than men's? The Department of Labour analysis makes it clear that the largest reason New Zealand women earn less on average than men is because women and men do different kinds of work - and women's work is paid less. Two of the Department of Labour's other explanatory factors - experience and education - link to this occupational difference. In many low paid women's jobs, there is no increase in pay for experience after the first year or two. There is no career ladder. To gain jobs with careers, as many women as men are now getting tertiary education, but studies of graduates show that after three and five years in the workforce women are earning less than men with the same level of qualifications. The industries and occupations that employ large numbers of graduate women pay lower rates. Lower pay in jobs, occupations and industries that employ mainly women is an indirect, structural form of gender discrimination. Equal pay for work of equal value means that, as well as women getting the same pay as men for the same job, women should get the same pay as men for doing a different but comparable job – that is, a job involving comparable skills, years of training, responsibility, effort and working conditions. This is a policy principle in international conventions ratified by New Zealand, which require government action. This principle is addressed by two New Zealand Acts: the Government Services Equal Pay Act 1960 and the Equal Pay Act 1972, both still in force. Despite this, equal pay for work of equal value is not being delivered under current wage bargaining law. Nor is it being respected by the current government in pay negotiations for its women employees in the public service, health and education.